Daniel Ricciardo and Max Verstappen retired within two laps of one another as Red Bull Racing suffered a dismal weekend at the Bahrain Grand Prix. Ricciardo was running a strong fourth before a complete electrical failure on lap four saw his car grind to a halt out on track, just seconds after Max Verstappen came together with world champion Lewis Hamilton in the middle of the pack, giving the Dutchman a puncture. Vertappen limped back to the pits but suffered suspension damage and pulled over a lap later. It capped an awful weekend for the 20-year-old, who started 15th after crashing heavily in qualifying. Sebastian Vettel extended his lead in the championship with his second win in succession, ahead of Valtteri Bottas in second with Hamilton recovering to third. Speaking afterwards, Verstappen said he felt Hamilton should have been investigated for his part in their incident. "We got a bit squeezed but from the middle to the end of the corner I was ahead," he said. "I then felt a nudge from behind and could feel the puncture and therefore knew the race was likely over. "From the start I was enjoying the feel of the car and finding the gaps and it was shaping up to be an exciting race." Ricciardo, who finished fourth in Australia, was running fourth again with the sight of Kimi Raikkonen's Ferrari in front before his car completely cut out. "This sport can rip your heart out, it’s brutal sometimes," he said. “Coming in to turn eight I lost all power, everything switched off without warning and I couldn’t do anything. "I guess it’s an electrical engine issue, maybe battery related but I don’t know exactly yet. Obviously, everyone in the team is so disappointed as we genuinely felt like we had a good car today. The weekend was going pretty good for us and I really believe our race car was even better. I know I only did one lap but I could already see Kimi sliding on the rear tyres. I really felt like we were going to be in with a good chance which makes it even more frustrating. "Being out so early in a race is just the worst feeling; especially when it’s a night race and you are up all day waiting for those two hours and after two minutes it’s over. I get really fired up for Sundays so now I’ve got two hours of adrenaline stored up inside me and I don’t know what to do with it." 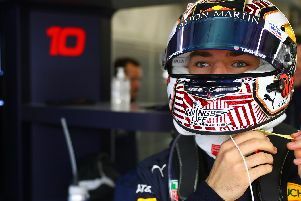 Team boss Christian Horner added: "Both cars retiring within two laps is extremely disappointing particularly when we had a race car today that was capable of challenging Ferrari and Mercedes."